View of “Duane Linklater: From Our Hands,” 2016–17. The drywall has been stripped from the side of the gallery’s entrance to expose the underlying brick and bright red scaffolding. White powder-coated steel and plywood beams populate the rooms, but instead of holding up the ceiling, they stand isolated, unattached. One beam wears a faux fur shawl draped over the top, while another stands on a crumpled floral-patterned doormat (Untitled Problem 15 and 8 [all works cited, 2016]). Omaskêko Cree artist Duane Linklater examines the oft-invisible framing that enables and prevents indigenous artwork from being seen. On one wall, a clear plastic tarp all but covers a framed digital print of an accession sheet (Accession) for a pair of white baby boots crafted from caribou, beads, and rabbit fur—valued at twenty-two Canadian dollars—by Ethel Linklater, the artist’s late grandmother. These boots were part of an exhibition in the 1980s, organized by the Ontario Arts Council, from which this show takes its name. Paying particular attention to the structures that display and house indigenous art, from state museums to private galleries, Linklater constructs stainless-steel armatures and concrete bases to present these art objects and family heirlooms (Speculative apparatus for the work of nohkompan, 1–9; nohkompan is a Cree word that translates to “my grandmother who is passed on”). Detailed caribou, moose, and rabbit-hide mukluks, slippers, and mitts made by Ethel—owned by Ontario’s Thunder Bay Art Gallery and on loan to Linklater—are presented atop his pedestals. “From Our Hands” is a collaborative show that traces the cultural and genealogical relations between Linklater, his twelve-year-old son, Tobias (whose stop-motion video, Origin of the Hero, is also featured), and Ethel. A bouquet of flowers and a pyramid of Du Maurier cigarettes among Ethel’s belongings rest on Linklater’s dark concrete plinths. 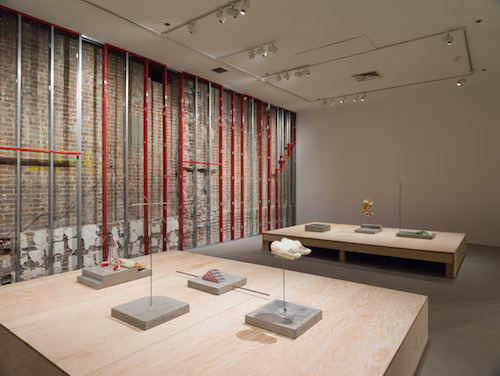 Interrogating the relationship between the materials that create the “neutral” gallery and the collections that fill it, the artist holds a space for his son while embracing his grandmother.